(Inside Science) -- The Serengeti-Mara ecosystem in Tanzania and Kenya is one of the largest and most beloved stretches of protected wilderness on Earth. But human pressures around the edges of the protected area may be harming the entire ecosystem, squeezing wildlife into a smaller area and depleting the richness of grass and soil. The new findings suggest that rather than focusing only on the core of an ecosystem, conservationists must find ways for humans and wildlife to coexist across much larger landscapes. "A lot of times people are just like, 'Well, let's just make sure we can protect the protected area, and that should be good enough.' And what we're trying to say is that if you do that, there are going to be consequences," said Mark Ritchie, an ecologist at Syracuse University in New York and one of the study's authors. The greater Serengeti-Mara ecosystem spans about 15,000 square miles -- four times the size of Yellowstone National Park -- and boasts everything from giraffes to hippos to cheetahs. 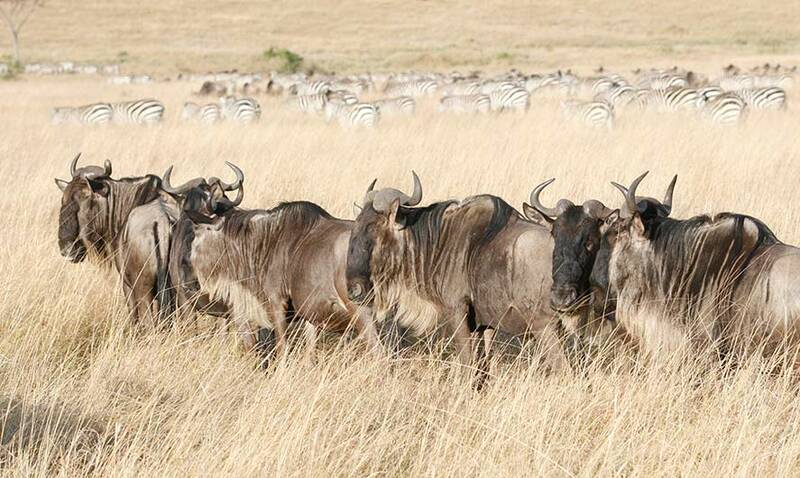 The beating pulse of this ecosystem is its roughly 1 million wildebeests. Traditionally, the wildebeests spent the wet season mostly in Serengeti National Park. In the dry season, they migrated up through the Maasai Mara region and left the areas with the most protection so they could reach grasslands further north, accompanied by a couple hundred thousand zebra. The western parts of the wildebeests' historic range, including Serengeti National Park and Maasai Mara National Reserve, make up the "core protected area" where no hunting, livestock or agriculture is allowed. The eastern parts of the animals' range have looser protections, and are occupied by Maasai people whose traditional livestock-herding lifestyle is relatively gentle on the landscape, said Ritchie. The northernmost part of the wildebeests' historic range is a patchwork of protected and unprotected areas. The new study, published today in the journal Science, combines four decades' worth of work from multiple independent research projects to track how this region is changing. The international team used census data to follow changes in human populations, and satellite data to review the expansion of agriculture and signs of overgrazing. Satellite data also revealed trails and corrals left when people bring livestock into protected areas illegally. The researchers also mapped the last two decades of movements of radio-tagged wildebeests to see how the animals have reacted. The final piece of the story came from eight sites in Serengeti National Park, where Ritchie and his colleagues compared plant growth and soil dynamics in fenced and unfenced plots of land. The fenced plots excluded grazing animals, allowing the researchers to see how changes in the behavior of wildebeests and other wildlife were affecting the ecosystem as a whole. The researchers found rising human populations all around the ecosystem, especially near the borders of the core protected area. According to the researchers, the number of humans in some border areas has quadrupled in the last decade. Agriculture has also increased. Farmers can't raise crops adjacent to the core protected area because elephants would trash their fields, said Ritchie. But since the 1980s, they have planted fields closer and closer to the western border of the ecosystem, squeezing livestock herders into a shrinking band of rangeland near the core protected area. At the same time, the herders have continued to acquire more cows and other animals. Now, said Ritchie, there isn't enough for the livestock to eat on legal rangeland, so people take their animals on illegal grazing trips into the protected areas. The western border is relatively well patrolled, so such illegal livestock incursions typically only reach a few miles into the core protected area. The bigger problems lie to the north and east, said Ritchie. Agriculture has taken over key parts of the wildebeests' northern dry season range, causing many animals to abandon their traditional northward migration. Instead, wildebeests now migrate to southwestern regions with poorer quality grass, which they previously used as an emergency fallback. Meanwhile, human and livestock populations have also been rising in the partially protected Maasai regions east of the core protected area. Some of the local Maasai have adopted farming lifestyles, leading to an expansion of agriculture in an area originally set aside for more environmentally friendly uses, said Ritchie. As a result, wildebeests are retreating into areas that are more protected, and the eastern regions are now less effective as wildlife-friendly buffer zones. The pressures on all sides of the greater Serengeti-Mara ecosystem have compressed wildlife into a smaller area consisting mostly of Serengeti National Park and a few adjacent nature reserves. The area routinely used by large numbers of wildebeests has probably shrunk to about half its original size, said Ritchie. A growing population of wild animals in Serengeti National Park may seem like a good thing for tourists, but it's toppling the balance of the ecosystem. Previously, wildebeests and other grazing wildlife improved the health of the soil by recycling nutrients through their dung. But now, there are so many animals that they are overgrazing the landscape. Plants can't grow fast enough to replenish organic matter in the food web, leading to lower levels of carbon in the soil. The researchers also found declines in plants and microbes that help enrich the soil with nitrogen and phosphorus. In past decades, rains in the Serengeti led to lush growths of grass. But now, less grass grows for the same amount of rainfall, even when the immediate effects of grazing are factored out. So far, the total number of wildebeests in the Serengeti-Mara ecosystem seems to be holding steady -- but that may not be true for long. "If this squeeze effect continues, my guess is that it will eventually result in a drop in the number of wildebeest, because you'll have a drought or something that will come along and they just won't have any options left," said Ritchie. The core protected area of the Serengeti-Mara is one of the largest in the world. Nevertheless, the new findings suggest it isn't big enough on its own to keep the ecosystem healthy. Conservationists might dream of setting aside even larger areas just for wildlife, but that's probably unrealistic in most situations, said Ritchie. The other option is buffer zones where wildlife and humans can coexist. That's what the partially protected lands on the east of the Serengeti are meant to be, although their value for wildlife is now disappearing -- an example of how difficult such buffers are to manage. "The activities around a protected area are critical to maintain the values inside the protected area," said James Watson, a conservation scientist at the University of Queensland in Brisbane, who was not involved in the study. The new study also emphasizes the need to identify and channel resources to the most ecologically valuable areas, said Watson. But that may be easier said than done, according to George Wittemyer, a conservation biologist at Colorado State University in Fort Collins who was not involved in the study. People tend to assume the important places are the ones where animals spend the most time. But a rarely used habitat may also be crucial, perhaps as a refuge in times of drought or as a pathway for young animals to disperse to other regions. A small rest spot may be essential for migrating songbirds, even though they use it for only a few days each year. "I think that's one of the big risks with conservation planning today, is that we tend to not really know what we're playing with," said Wittemyer. "We often learn after it's too late."